Hip arthroscopy is a procedure that views the interior of the hip joint through the medium of an arthroscope and treats any hip joint pathology with a minimally invasive approach. This type of minimally invasive technique has gained popularity for its smaller incision and shorter recovery time as compared to the conventional surgical techniques. The entry of newer tools and technology in this technique has made it easier to distract the hip joint and treat its pathologies with more precision. 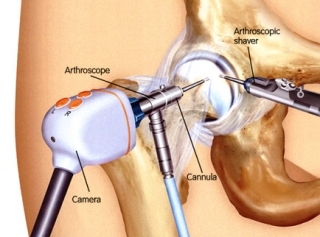 This has led to a surge in the popularity of hip arthroscopy procedures. The technique of arthroscopy to visualize the happenings inside a joint was first put forth by Severin Nordentoft in 1912. Since then, this procedure has seen numerous changes for the better. The commonest use of hip arthroscopy is in the treatment of Hip impingement or femoro-acetabular impingement (FAI) syndrome and labral tears. Hip impingement usually results from an abnormality in the ball and socket joint of the hip. There are two types of hip impingements, cam impingement that arises from a deformed head of the femur or thigh bone, and pincer impingement that results from an abnormality in the acetabulum or socket of the hip joint. Cam impingement is more likely to occur in male athletes like cyclists, runners, or even dancers, whereas pincer impingement is more common among middle-aged women. Other conditions that are often treated with hip arthroscopy surgery are hip injuries that cause femoral head or acetabulum fractures, malunion of an old hip fracture, loose foreign body within the joint, chronic hip pain from avascular necrosis, chronic arthritis (Rheumatoid, psoriatic, or lymes arthritis), ligament tears, and synovial biopsies. Hip arthroscopy is preferred over the conventional or open hip surgeries among athletes, runners, and cyclists due to its minimally invasive nature. Open surgery of the hip may result in long-term damage to the surrounding components of the hip joint resulting in an inability to return to former athletic activities. However, the results with hip arthroscopy are much better. Who is eligible for a hip arthroscopy? Individuals with a diagnosis of hip impingement or femoro-acetabular impingement that has been confirmed with appropriate MRI, CT scans or X-rays. Severe symptoms of hip impingement characterized by hip pain that is worse on squatting and prolonged sitting, sudden pain when the hip is flexed at 90 degrees with adduction and internal rotation like when sitting cross-legged or with extension and external rotation, and limited activities of the hip joint from pain. A minimum duration of 6 months since the diagnosis of hip impingement is required to be considered for this surgery. Individual is 15 or above or skeletally mature. Symptoms fail to respond to conservative treatment, medications, and physiotherapy Outcome of hip arthroscopy The outcome or result of this surgery depends on the underlying indication for surgery and the surgical expertise of the surgeon. In cases where hip arthroscopy was performed for hip impingement or FAI, 80% patients experienced improvement at the end of the first year, 15% experienced no changes, while 5 % experienced a worsening of their symptoms. Most of the patients require physiotherapy that includes isometric exercises and stretches followed by dynamic and plyometric weights exercises. The patients may also require a variable amount of time on crutches post-surgery. Athletes are advised to refrain from impact sports for at least three months and contact sports for four months or more. If you have hip pain or would like a second opinion, contact our specialists at Orthopedic Surgery San Diego today.